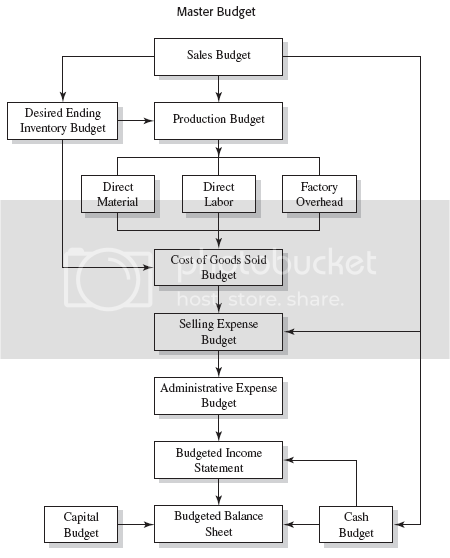 To you who have been waiting for “budgeting process guide”, now I am coming with a comprehensive guiding on how to construct a budget for businesses purposes, with a single case example (for easier understanding). But before that, let’s talk about the main resources of every types of budget be called “Master Budget”. A comprehensive master budget is a formal statement of management’s expectation regarding sales, expenses, volume, and other financial transactions for the coming period. It consists basically of a pro-forma income statement, pro-forma balance sheet, and cash budget. At the beginning of the period, the budget is a plan or standard. At the end, it serves as a control device to help management measure its performance against the plan so that future performance may be improved. It provides for the basic management decisions about marketing. Based on those decisions, it is an organized approach for developing a comprehensive sales plan. If the sales plan is not realistic, most if not all of the other parts of the overall profit plan also are not realistic. Therefore, if the management believes that a realistic sales plan cannot be developed, there is little justification for profit planning and control. Despite the views of a particular management, such a conclusion may be an implicit admission of incompetence. Simply, if it is really impossible to assess the future revenue potential of a business, there would be little incentive for investment in the business initially or for continuation of it except for purely speculative ventures that most managers and investors prefer to avoid. To reduce uncertainty about the future revenues. To incorporate management judgments and decisions into the planning process (e.g., in the marketing plans). To provide necessary information for developing other elements of a comprehensive profit plan. To facilitate management’s control of sales activities. Sales planning and forecasting often are confused. Although related, they have distinctly different purposes. A forecast is not a plan; rather it is a statement and/or a quantified assessment of future conditions about a particular subject (e.g., sales revenue) based on one or more explicit assumptions. A forecast should always state the assumptions on which it is based. A forecast should be viewed as only one input into the development of a sales plan. The management of a company may accept, modify, or reject the forecast. In contrast, a sales plan incorporates management decisions that are based on the forecast, other inputs, and management judgments about such related items as sales volume, prices, sales effects, production, and financing. Most companies do not really manage top-line growth. They allocate resources to businesses they think will be most productive and hope the economy cooperates. But a growing number of companies are taking a less passive approach and studying revenue growth more carefully. They argue that quantifying the sources of revenue can yield a wealth of information, which results in more targeted and more effective decision-making. With the right discipline and analysis, they say, growing revenues can be as straightforward as cutting costs. Some companies go so far as to link the two efforts. The idea is to bring the same systematic analysis to growing revenue that we have brought to cost cutting. A “Sources of Revenue Statement (SRS)” is useful in this effort. The information on revenue captured by traditional financial statements is woefully inadequate. Sorting revenues by geographic market, business unit, or product line tells the source of sales. But it does not explain the underlying reason for those sales. Determine revenue from the core business by establishing the revenue gain or loss from entry to or exit from adjacent markets and the revenue gain from new lines of business, and subtracting this from total revenue. Determine growth attributable to market positioning by estimating the market growth rate for the current period and multiplying this by the prior period’s core revenue. Determine the revenue not attributable to market growth by subtracting the amount determined in Step 2 from that determined in Step 1. To calculate base retention revenue, estimate the customer churn rate, multiply it by the prior period’s core revenue, and deduct this from the prior period’s core revenue. To determine revenue from market-share gain, subtract retention revenue, growth attributable to market positioning, and growth from new lines of business and from adjacent markets from core revenue. The company uses a single material and one type of labor in the manufacture of the product. It prepares a master budget on a quarterly basis. Work-in-process inventories at the beginning and end of the year are negligible and are ignored. The company uses a single cost driver—”Direct Labor Hours (DLH)“—as the allocation base for assigning all factory overhead costs to the product. Now, you can go on yourself. On my next post, we will talk about “Sales Budget”, how a sales budget is constructed, in detail.